MOSCOW, January 15. /TASS/. 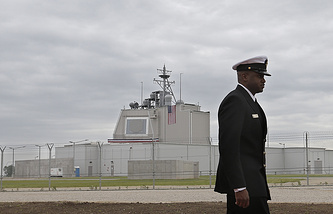 Russia suspects that the United States may have access to controlling the Aegis Ashore missile defense systems after their deployment in Japan, Russian Foreign Minister Sergey Lavrov told an annual news conference while reviewing Russian diplomacy in 2017. "We’ve heard Japan will control this system while the United States will have nothing to do with it at all, but we have serious doubts this will be really so," he said. "We would like the dialog between the secretaries of the Russian and Japanese security councils to produce more convincing proof," Lavrov said. "We know not a single incident around the globe in which the United States would deploy its weapons only to place the controls in the hands of the host country. I feel very strong doubts the US will make an exception in this case." Moscow, Lavrov went on to say, is interested in launching a missile defense dialogue with Washington. "For the time being our US counterparts, just as their predecessors in the Obama and Bush administrations, have been saying we have nothing to worry about, that all that is not against us. But there is solid evidence this is not so," he concluded. In December 2017 the Japanese government approved the decision to host two Aegis Ashore systems. They are to be stationed at test sites of Japan’s self-defense force in the northern prefecture Akita and southeastern prefecture Yamaguchi by 2023 or earlier. For the Aegis Ashore systems Tokyo plans to purchase four SM-3 Block 2A missiles with a range of flight of up to 1,000 kilometers.